There have been countless moments of excellence and excruciation over the first 245 meetings between UNC and Duke. Before the first Duke-Carolina showdown of the season, which you can watch on ESPN Thursday night at 8, here's a glimpse of some of the most memorable matchup moments. Bloody Montross: The Heels gentle giant goes to the line and sinks two clutch free throws with the remnants of some Blue Devil elbows streaming down his face. What many consider the greatest game in the entire storied history between the two schools. 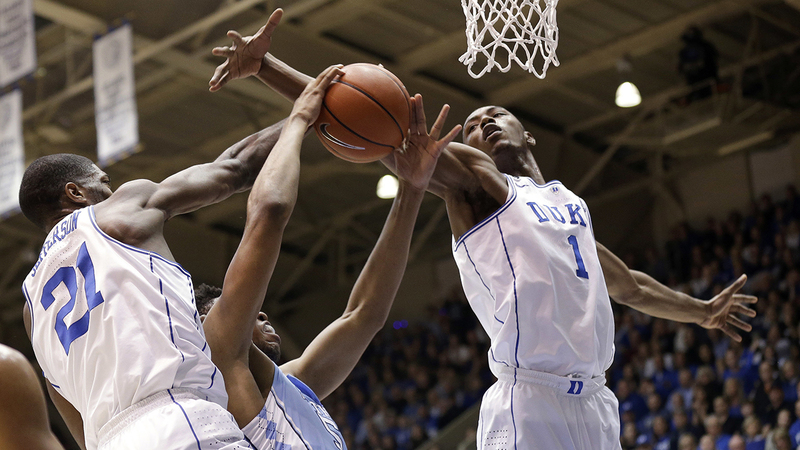 A 102-100 double-overtime Tar Heel win at Cameron. Stack's Strut: I don't need to tell you about his reverse dunk, but it was the walk afterward, jaw out, head bobbing that personified the Stack swagger. The Hug: Mike Krzyzewski shared an embrace for the ages with senior Steve Wojciechowski after the Blue Devils stormed back from 17 down midway through the second half for K's 500th win and an ACC regular season title. Duhon's Reverse: Roy Williams' first tangle with Mike Krzyzewski after coming home to Chapel Hill. Duhon's daring overtime reverse with 6.5 seconds left gave Duke its 5th win in six tries in Chapel Hill. Marvin's Putback: This was my in-person introduction to the rivalry after starting at ABC11 months earlier. Needless to say, after Marvin Williams went off the glass and the roof flew off the Smith Center, I was sold. Fist Meets Nose: Carolina had the game won. Tyler Hansbrough missed a FT, grabbed the rebound, and Gerald Henderson and his flailing fist cemented his spot in rivalry history. Greg Paulus, Meet Danny Green: Carolina scored the final 10 points to win the game, but this first half hammer is all anyone remembers now. The Dagger: UNC was up 10 with just over two minutes to go. That lead would not last. Austin Rivers made sure of it at the buzzer over the not quite long enough arms of Tyler Zeller.